Recently, I had a chance to play around with Raspberry Pi 3. The first thing I did was to try and control a LED light using RPi. Let me explain how this works, so that you can try this at home. This post will guide you through the process and following are the prerequisites. Ok, so once everything is ready it’s time to jump into the game. Now you can ssh into RPi with the IP address of Pi which you can find from model status page. Your default username for Pi will be pi and the password will be raspberry. if the authentication is successful it’ll take you to your Pi’s console. Above commands will install pip and flask in your Pi. pip is a package manager for python and flask is a python based micro web framework. Wiring the board will the next major task. Here we’re using the pin 7 for positive and negative terminal is grounded to ground pin of the Raspberry Pi. 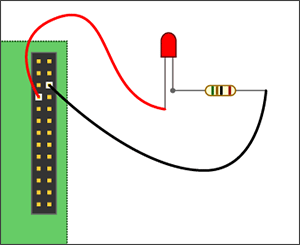 The wiring will be like the following diagram. The main task now is to create a simple web app with flask which handles the request and control the LED power supply. And here is the code for achieving that. Copy paste it to the file. 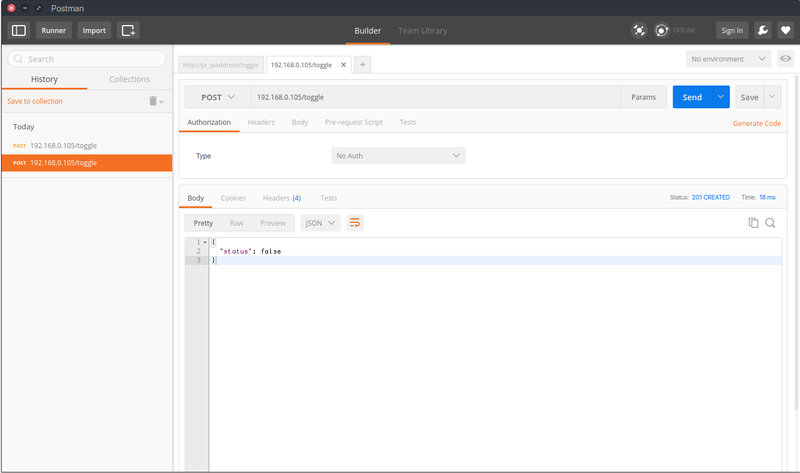 Now open up your rest client like Postman or Advance Rest Client and raise a POST request to something like below. If everything works fine you’ll find status of the light returned and the light will toggle its state. This is a quick run through of Setting Raspberry Pi with WebServer to control LED.